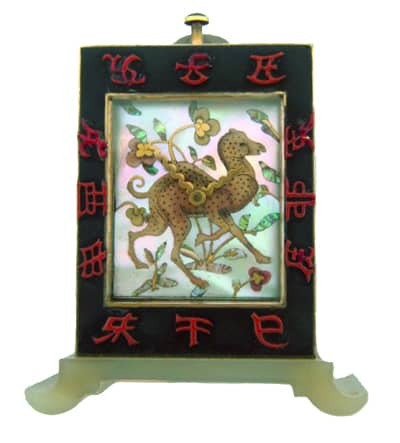 Art Deco Marchak Desk Clock with Mother-of-Pearl and Camel Motif. Photo Courtesy of Frances Klein Classic Jewels. 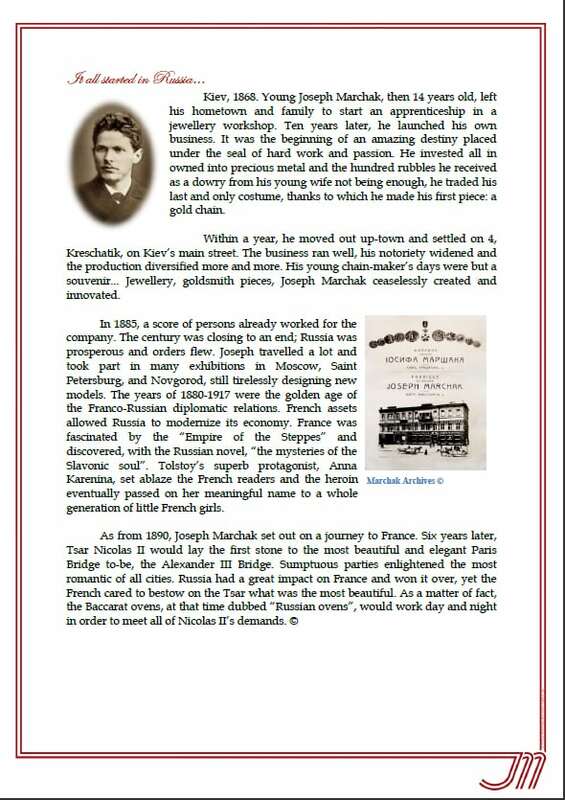 Born in Ignatovka just outside of Kiev, Joseph Marchak was apprenticed to a jeweler in 1868 at the age of 14. 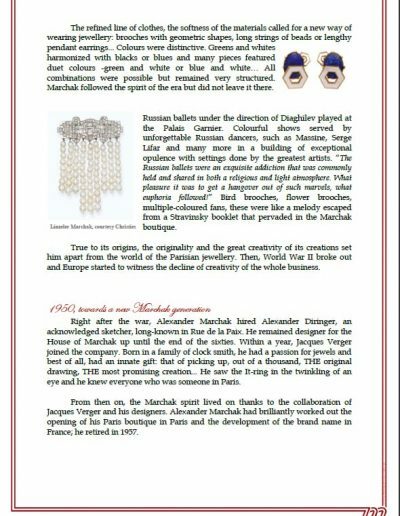 Within ten years he had opened his own shop and, within twenty, Marchak had gained international renown as one of the most important jewelers in the Russian Empire. 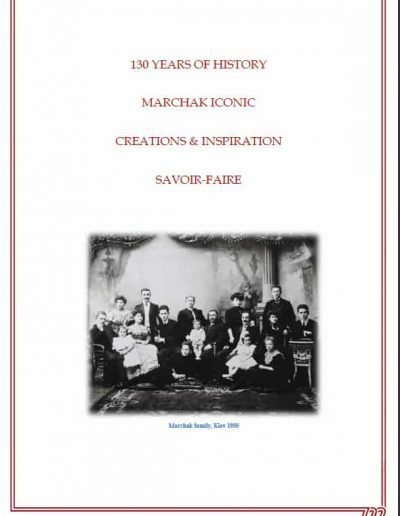 Winning a medal at the Chicago World’s Fair in 1893 and one in Antwerp in 1894, Marchak became known as the “Cartier of Kiev.” Unfortunately, Joseph Marchak died at the relatively young age of 64. 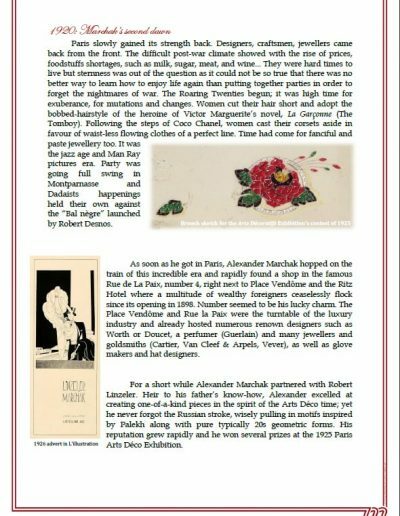 With the upheaval of the Russian Revolution and the end of World War I, the Marchak family gathered what jewelry they could and fled to Paris. 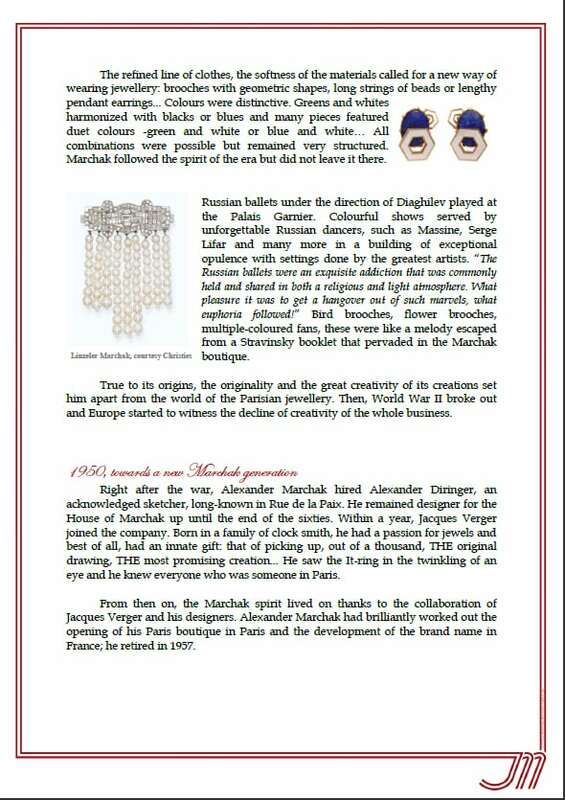 Alexander Marchak opened a shop on the Rue de la Paix in 1920 where his fine quality and original designs gained fame. But business was once again interrupted by a World War and Marchak was forced to reinvent itself yet another time. After business began to recover from the effects of war, Alexander Diringer, who worked at Sterlé, was brought aboard as the chief designer and remained so through the 1960’s. 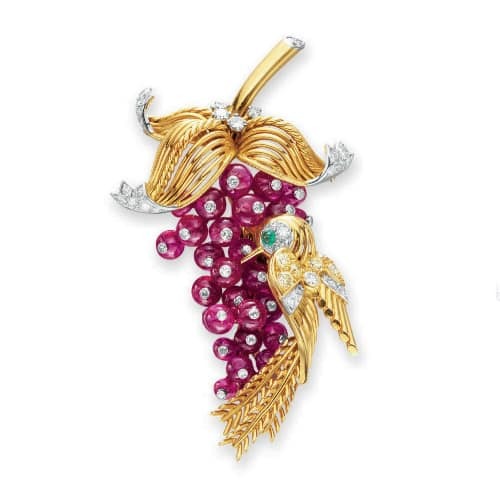 Marchak Ruby Berries and Gold Hummingbird Brooch. 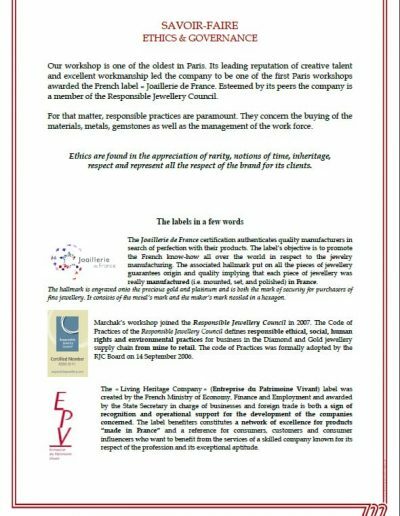 Another jeweler working in Paris, Jacques Verger, ran a successful workshop behind the scenes creating for the likes of Boucheron, Cartier, Gübelin, Tiffany, Van Cleef & Arpels and more. 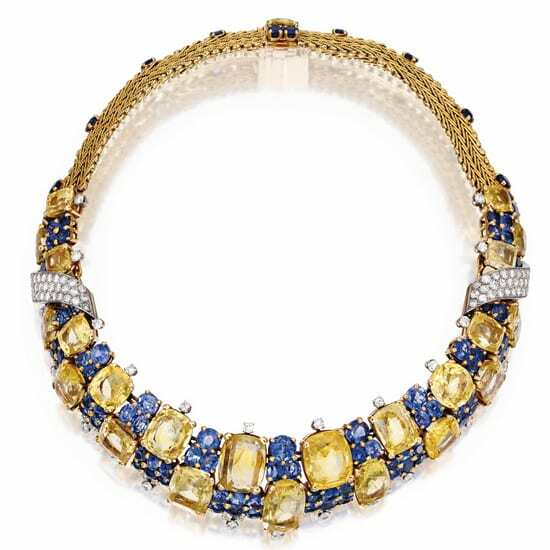 His sons, Georges and Henri, also in the business, supplied Lacloche, Janesich, Ostertag, Chaumet, Black, Starr & Frost, J.E. Caldwell and many others from the 1920’s through the 30’s. Henri’s son, Jacques, began his career working behind the counter for Ostertag and later, Sterlé. 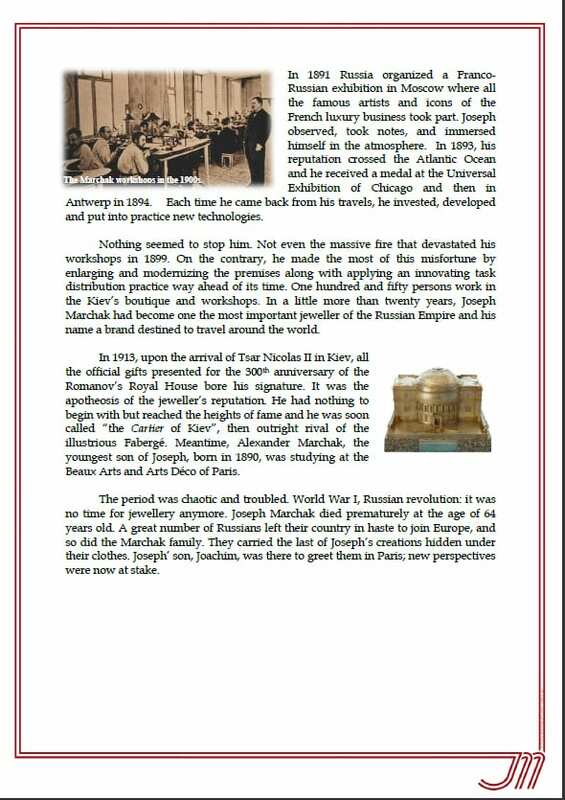 While there, he also caught the attention of Alexander Marchak and went to work for him as a sales clerk in 1946, a very slow time for the jewelry business. 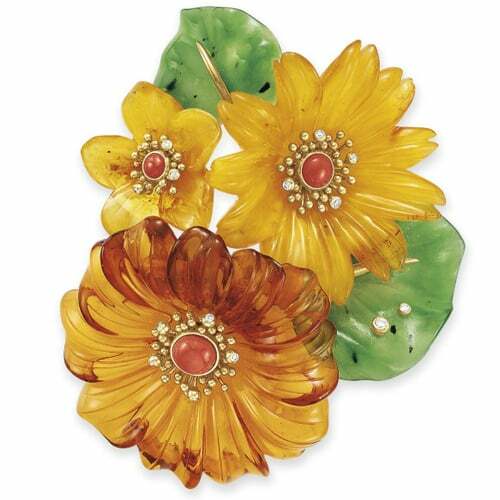 Marchak Carved Multi-Stone Carved Floral Brooch. Marchak Gold and Diamond Woven Motif Crossover Necklace with Diamond Terminals. The combination of Verger’s management style and the talents of Diringer and Degommier, who were added to the team in 1958, assured success for Marchak. 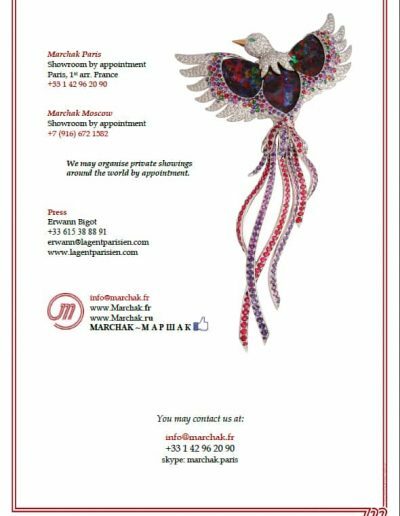 The craze for floral designs in the 1950’s was perfect for Marchak together with the birds and bugs that go along with the theme. 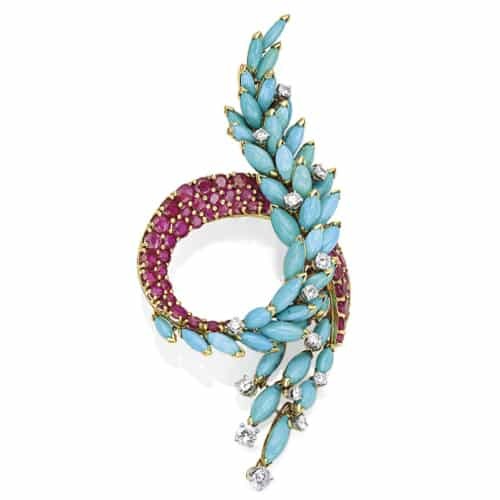 The designer’s sketches were rendered perfectly in brightly colored gems and metals. Without a workshop of their own, pieces were produced by various other manufacturers. 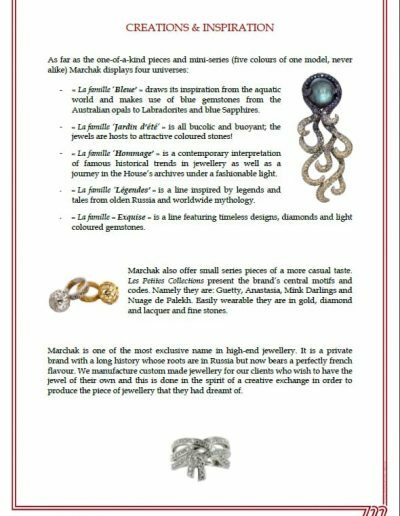 Unfettered by the burden of overhead borne by the other jewelers in Place Vendôme, Marchack was free to follow its own muse. Their designers were instructed to “keep their eyes closed” when they passed the windows of other jewelers so as to preserve their unique style. Jacques Verger set out to win the American market. 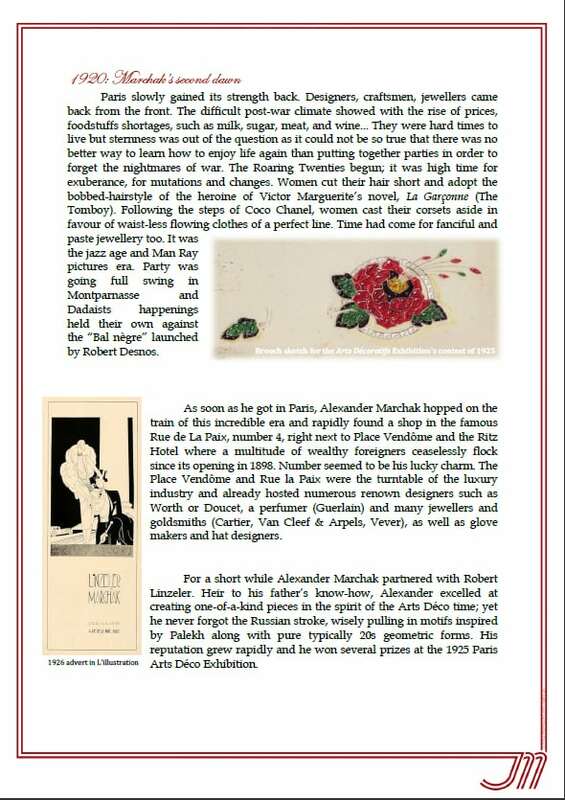 Turning on his notorious French charm, he took their collection to New York every fall, exhibiting privately in Fifth Avenue hotels. Marchak’s bold compositions captured the hearts of American women. 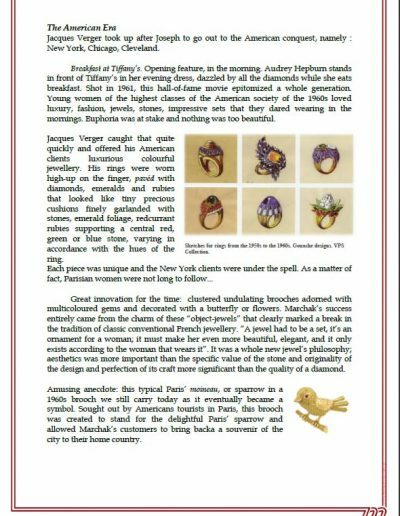 The flamboyant rings created during this period with cabochons perched high atop richly jeweled galleries were the firms biggest success. 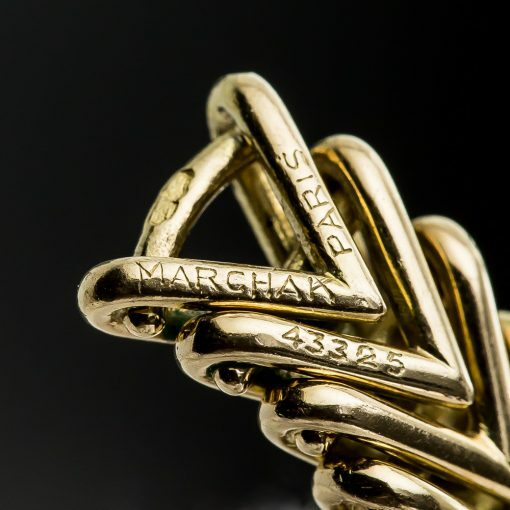 Verger was known for bestowing precious objets on his clients: Jacqueline Kennedy received a black lacquer and gold desk set and Eisenhower shot rifles with richly decorated rifle butts by Marchak. 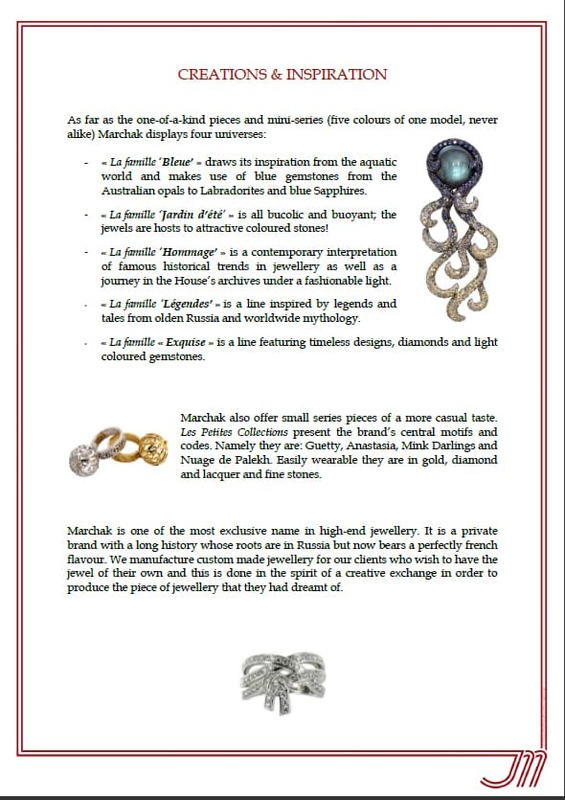 Marchak was appointed jeweler to King Hassan II of Morocco through Verger’s relationship with the monarch. 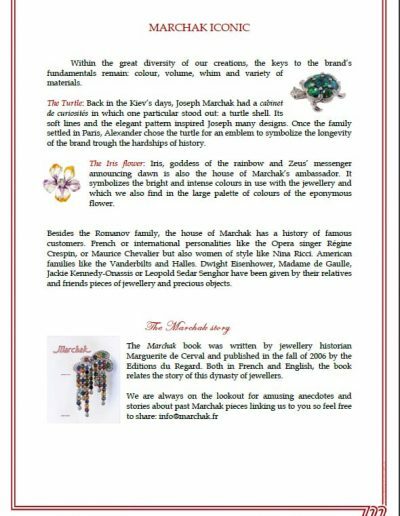 His Majesty liked to be in control of all aspects of the jewelry he commissioned, usually to bestow on other heads of state. 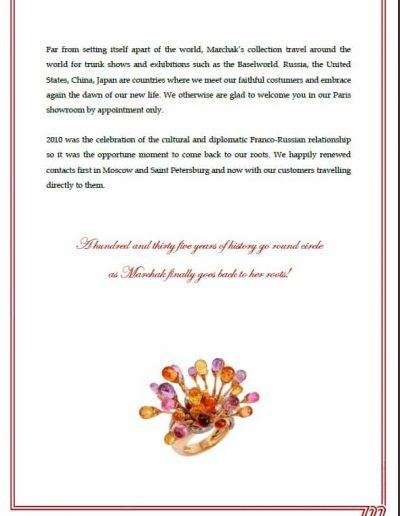 Eastern culture was thus combined with French elegance to great success. Diringer retired in 1967 leaving Verger and Degommier to continue the Marchak name. 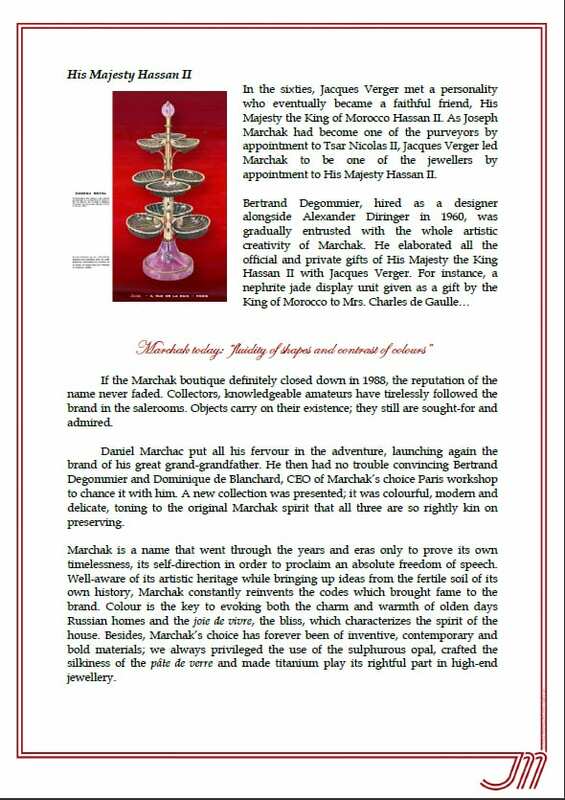 In 1988 the Marchak boutique was sold to Daum and the Marchak identity was temporarily silenced. 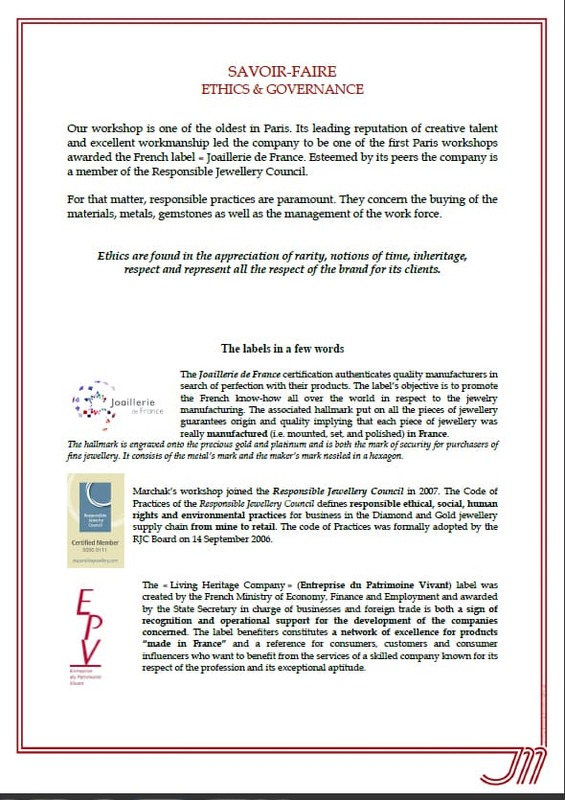 A grandson of Marchak is leading a contemporary revival of the name, with design teams being trained by Degommier and manufacturing being done by Cristofol, Paris. 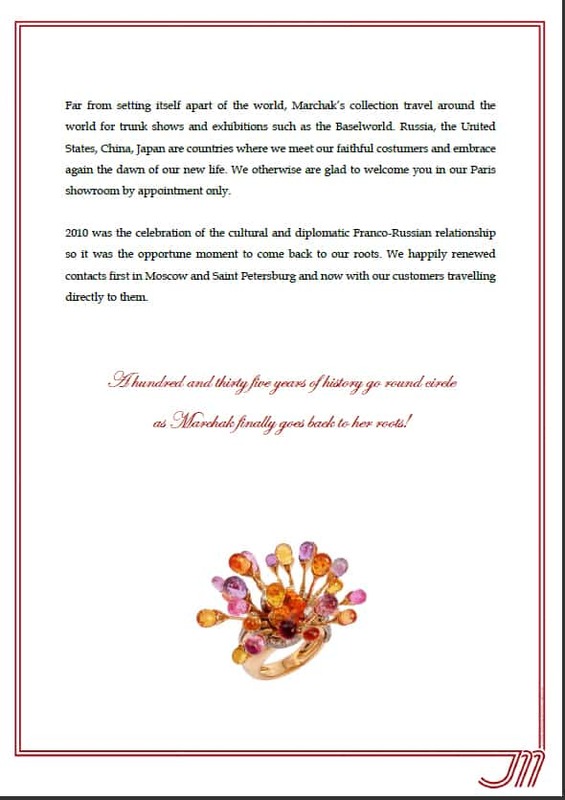 The grand opening in Paris on rue de Richelieu took place in April of 2005. 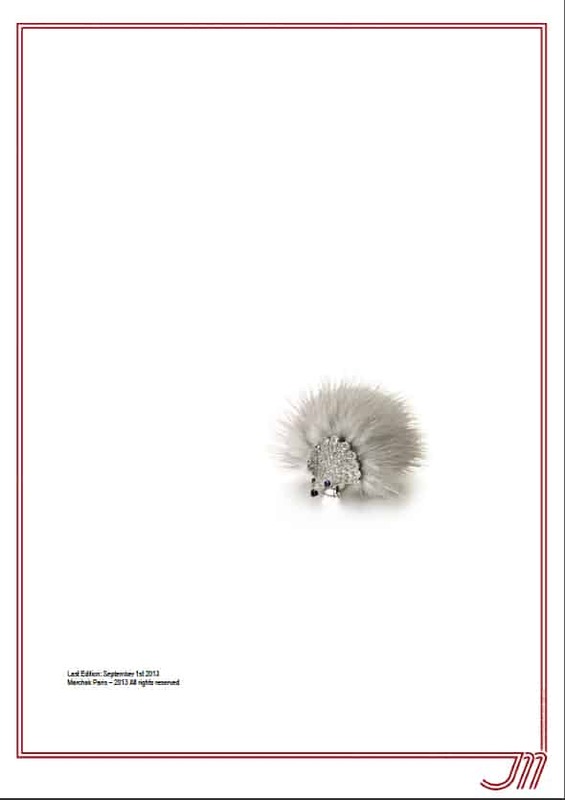 The tradition of rejecting mass production continues ensuring a lively unique product for each customer. 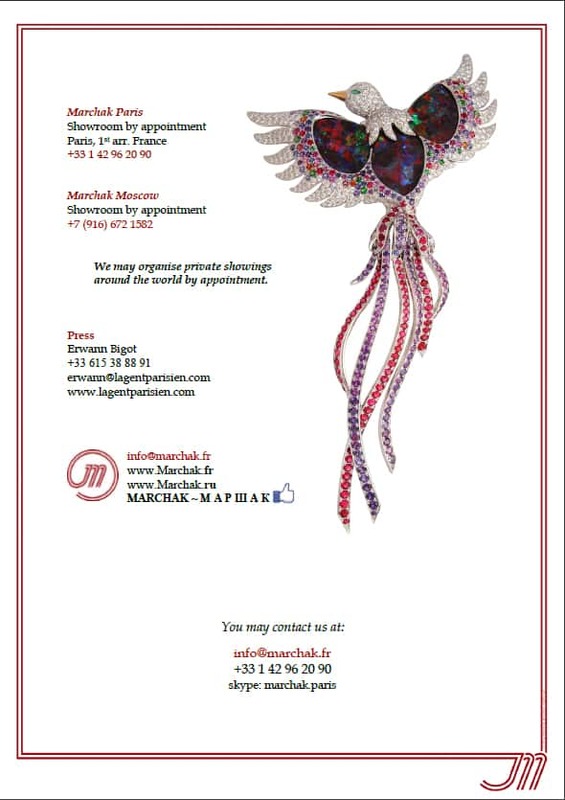 Marchak Swirl Turquoise and Ruby Brooch. 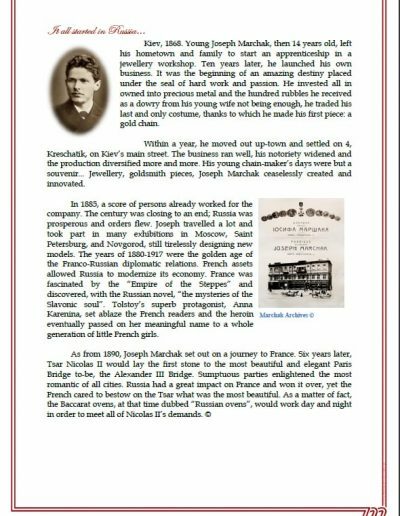 Joseph Marchak set up a jewelry and goldsmith’s workshop. 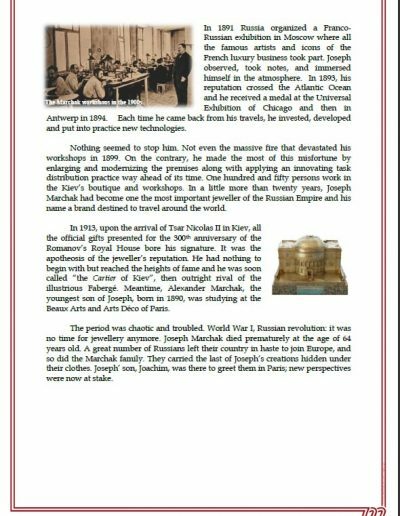 Joseph attends the Universal Exhibition in Paris which had a powerful influence on his work. Marchak wins a Gold Medal in Antwerp. 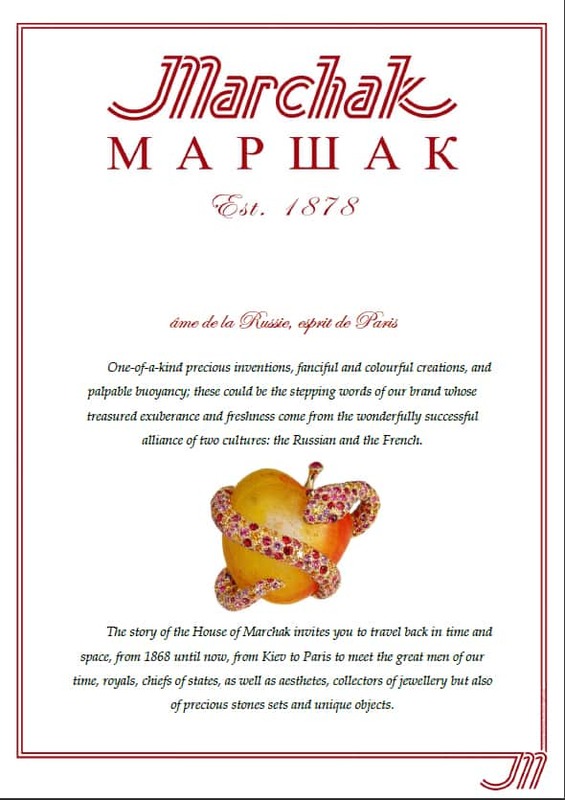 Marchak wins a Sliver Medal at the Paris Exhibition. 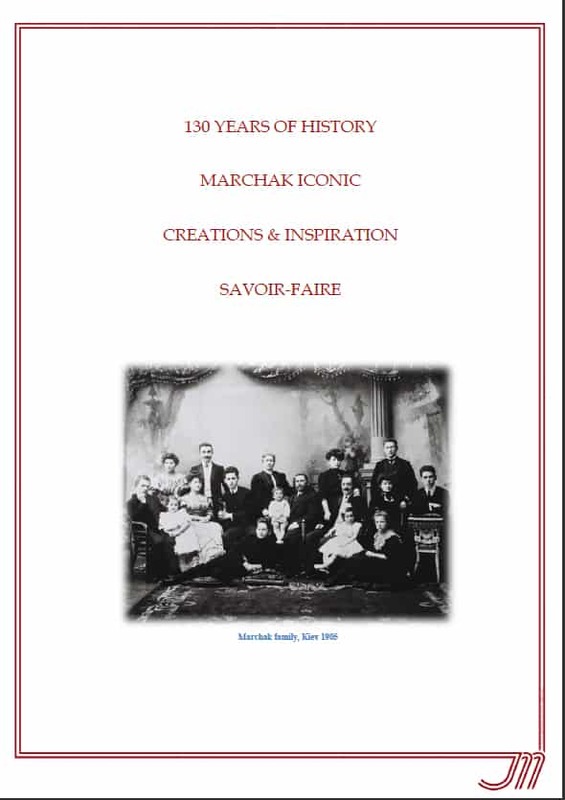 Marchak wins Gran Prix at the Liege Universal and International Exhibition. Alexandre Marchak joins the firm. 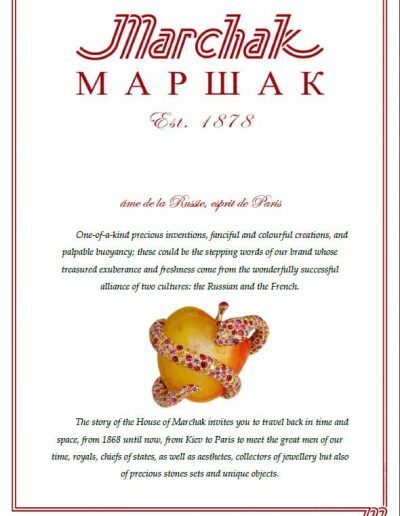 Known as the “Cartier of Kiev” Marchak employed 1850 workers. 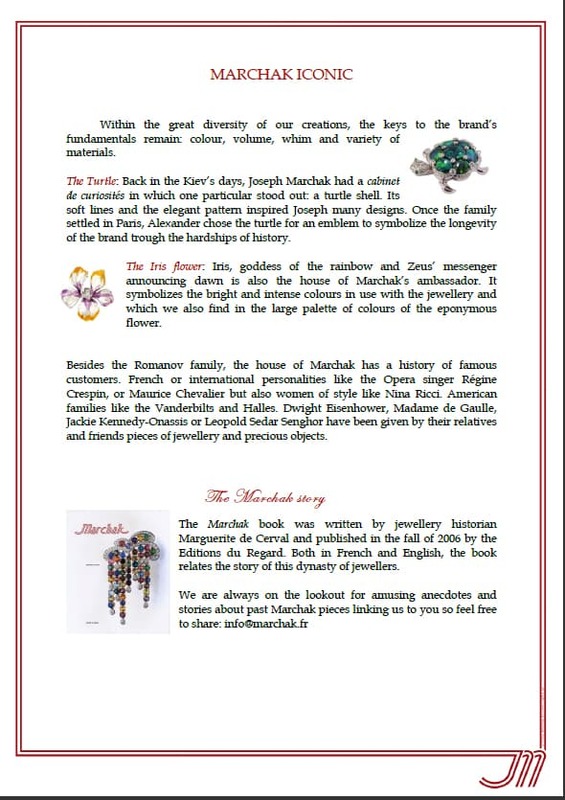 Alexandre sets up the “Joseph Marchak” jewelry business in Paris. 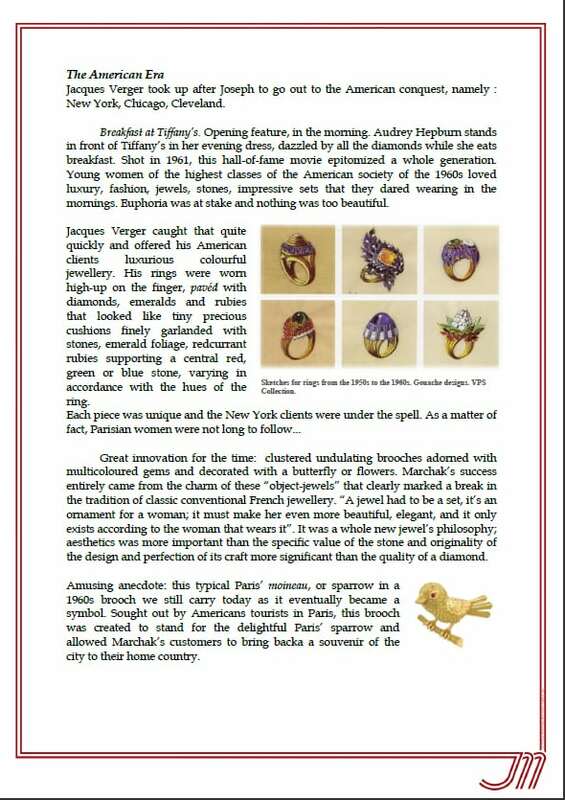 Partnership with Robert Linzeler creating famous Art Deco jewels. Gran Prix at the Exposition des Arts Decoratifs. Alexander Diringer, previously of Cartier and Sterlé was hired as head designer. Jacques Verger joined the firm. 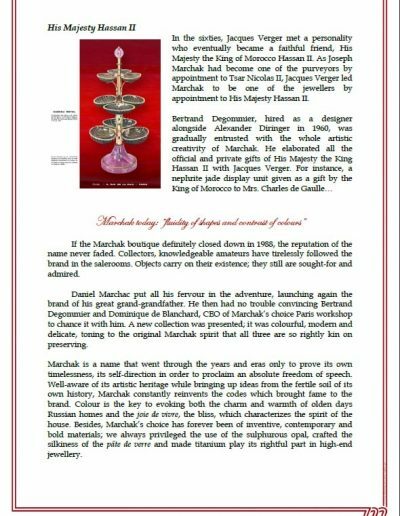 Alexander Marchak left the firm – bought out by Verger. 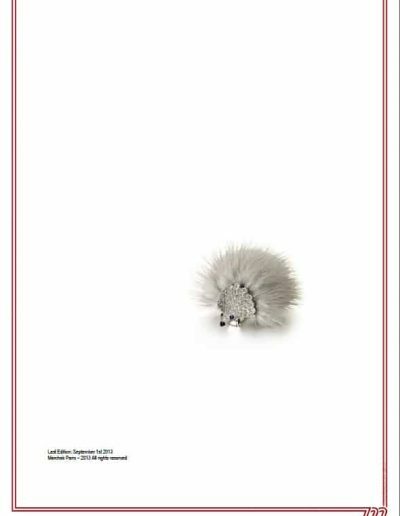 Bertrand Degommier is a partner and designer. The firm is renewed by relatives of Alexandre and Joseph in conjunction with designer Bertrand Degommler with a new collection.